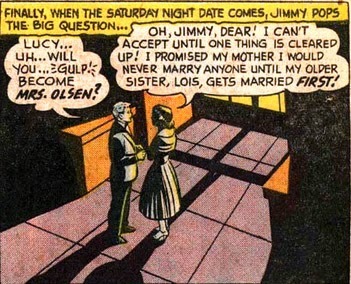 Lucy's first appearance ends with Jimmy asking her to marry him. Oh, she's got him all twisted around her little finger! Why doesn't she say yes? 1. Anything so Lois does come off as an old maid. 2. Her moving to Metropolis and dating Jimmy is all an elaborate plan to rumble Superman out of his secret identity. Yes, Lucy is the Devil, but Lois? Lois is the Devil's big sister. Are we CERTAIN there isn't? For the record, Lucy later married Jimmy. 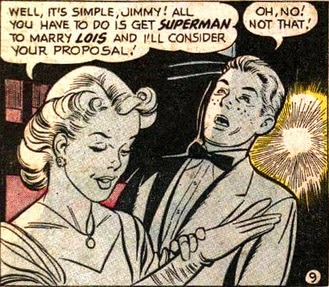 The lettercols stated that everyone recognized Lois would never marry unless it was Superman, so if the Lanes wanted any grandkids... The Olsen-Lane marriage was never consummated, however, due to the machinations of Miss Gszpltnz (sp?) -- Mxyzptlk's girlfriend.